The Great Salt Lake Desert sprawls across a large area of northwestern Utah, one of the iconic landforms derived from a huge Pleistocene body of water, Lake Bonneville, that once covered some 20, 000 square miles in the Great Basin. Normally separated by a low divide from the basin containing the Great Salt Lake to the east, the desert features gleaming, incredibly level salt flats famous for attracting high-speed motorists. Visitors here explore one of the more otherworldly sites in the country and must respect the challenges of a harsh, arid climate. The Great Salt Lake Desert is part of the much larger Great Basin Desert, which encompasses portions of Oregon, Idaho, Nevada, Utah and small slivers of Arizona and California. The Great Basin Desert is a cold desert, with lower annual temperatures than the hot deserts to the south - such as the Mojave, Chihuahan and Sonoran - because of its more northerly position. Much of its scant precipitation falls as snow. The climate is arid: Wendover, Utah, on the western margin of the Great Salt Lake Desert, received an average total of 4.7 inches of precipitation annually between August 1924 and December 2005, according to Western Regional Climate Center. For the same period, July experienced, on average, the hottest maximum temperature (92 degrees Fahrenheit), while January had the coldest (19.3 degrees). During the Pleistocene, the southward advance of continental glaciers across the northern latitudes of North America reflected a cooler, moister climate than that of present day. Spurred by reduced evaporation, greater precipitation and glacial meltwaters, basins of the interior West filled with large lakes during this time, including the massive Lake Bonneville. According to the Utah Geological Survey, Lake Bonneville's maximum dimensions were roughly 325 miles long by 135 miles wide, with depths exceeding 1, 000 feet in places. Lake Bonneville shrank mainly because of a warming, drying climate, although it also lost some of its extent around 15, 000 years ago when it over-spilled at Red Rock Pass in modern-day Idaho, unleashing the Bonneville Floods. 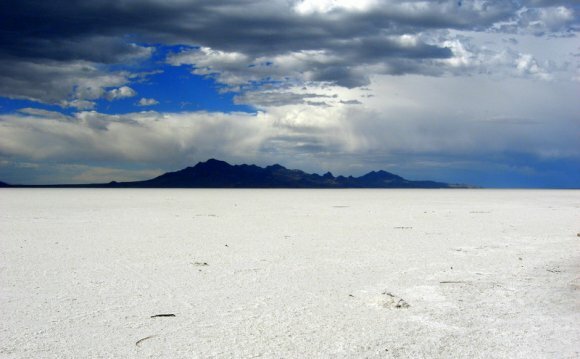 The Great Salt Lake and the Bonneville Salt Flats in the desert are relics of Lake Bonneville, the salts derived from millenniums of mineral accumulations and high evaporation rates in these closed basins. While large swaths of the Great Salt Lake Desert are alkaline flats devoid of much vegetation, there are numerous shrubs and grasses endemic to the region adapted to the tough climate. The numerous species of sagebrush are the most well-known, but arid basin floors also support saltbushes. The climatic challenges also affect animal life: Many species, such as kangaroo rats and rattlesnakes, are mainly active at night in the heat of summer, while others display morphological adaptations for thermoregulation, such as the huge ears of the black-tailed jackrabbit. The Great Salt Lake Desert's harsh climate means visitors to its salt flats and dunes must take precautions. Wear sun protection - not just sunscreen of adequate power, but also wide-brimmed hats and long-sleeved clothing. In winter, be prepared for potentially frigid temperatures and driving snow. The Great Salt Lake Desert of Utah.